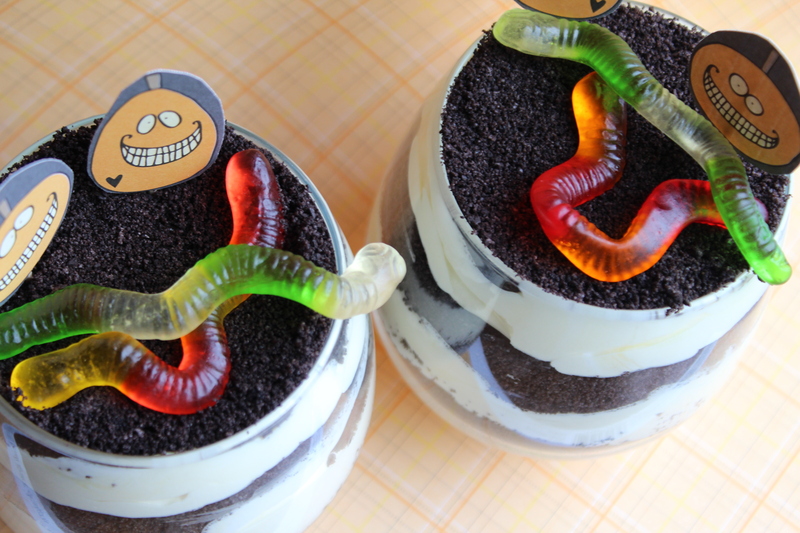 The very first time I had dirt cake was when I was in elementary school and my aunt prepared it in a flower pot, complete with a plastic flower and gummy worms. I didn’t believe her when she told me it was a dessert. (The dirt looked so real!) Since then, I have made this dessert a handful of times, sometimes in a large serving bowl, sometimes in individual cups. I’ve dressed it up and I’ve dressed it down. Today, I gave it a Halloween theme. 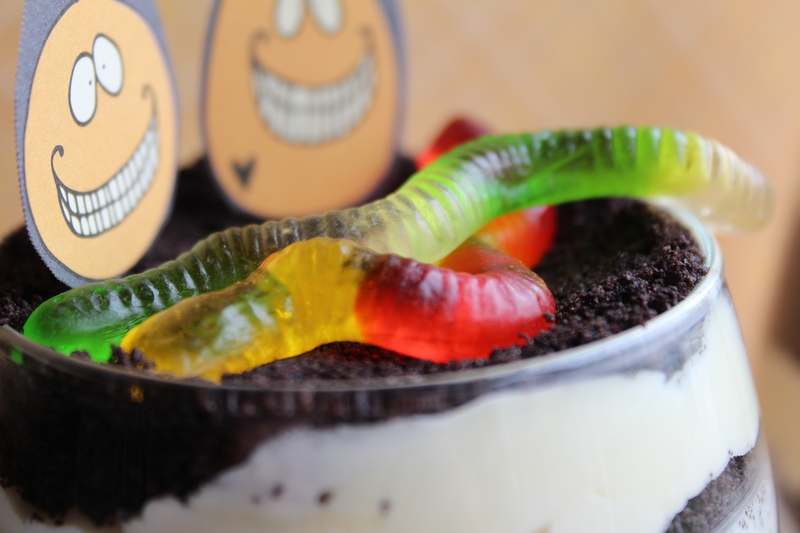 Kids love this dessert because of the gummy worms. 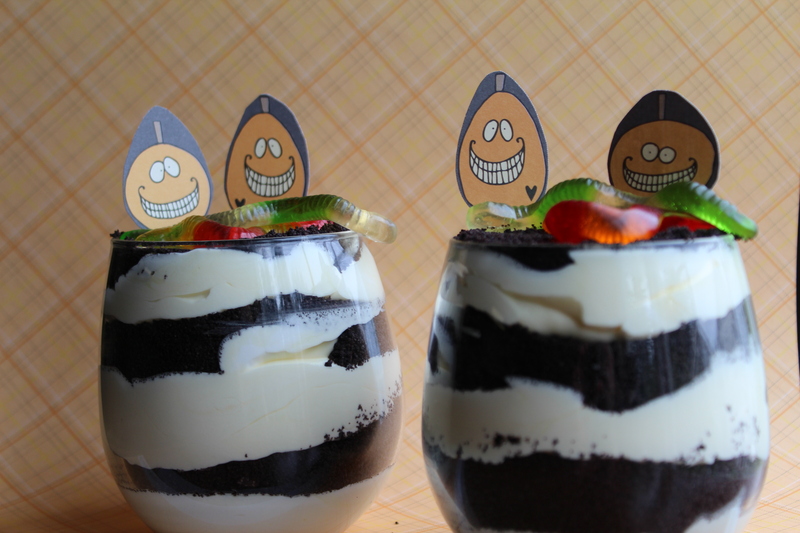 I have yet to meet a kid who doesn’t like gummy worms–or pudding, or Cool Whip, or Oreos. I should clarify–what adult dislikes any of these? I make this dessert with vanilla pudding, partly because I don’t like chocolate pudding, and partly because I like the layering look this dessert brings. You can make it with either. For the pumpkins, I just cut out scrapbook paper and glued a toothpick behind it. You could have skulls, or tombstones, or even haunted houses if you like. In a mixing bowl with a paddle attachment, mix cream cheese, butter, and powdered sugar for about 2 minutes, until smooth and there are no lumps. In another bowl, mix (using a hand mixer or stand mixer) pudding and cold milk for 2 minutes, until it starts to get a little thick. Fold into the cream cheese mixture, then fold in the Cool Whip. Make sure that you fold and not mix, and that all the pudding at the bottom of the bowl gets folded in. 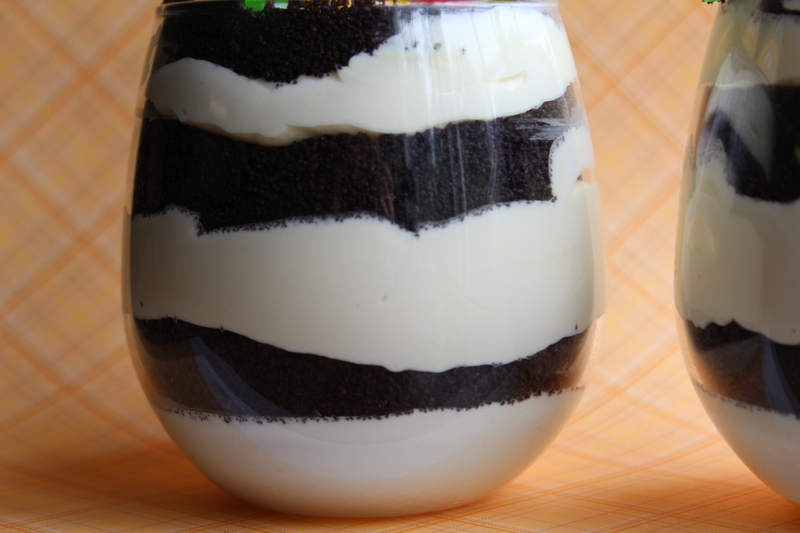 In whatever serving bowl you choose, alternate layers of the pudding mixture and the Oreo mixture, making sure you start with the pudding mixture and end with the Oreo mixture. Place in the fridge to chill for a few hours or overnight. Serve with gummy worms, if desired. 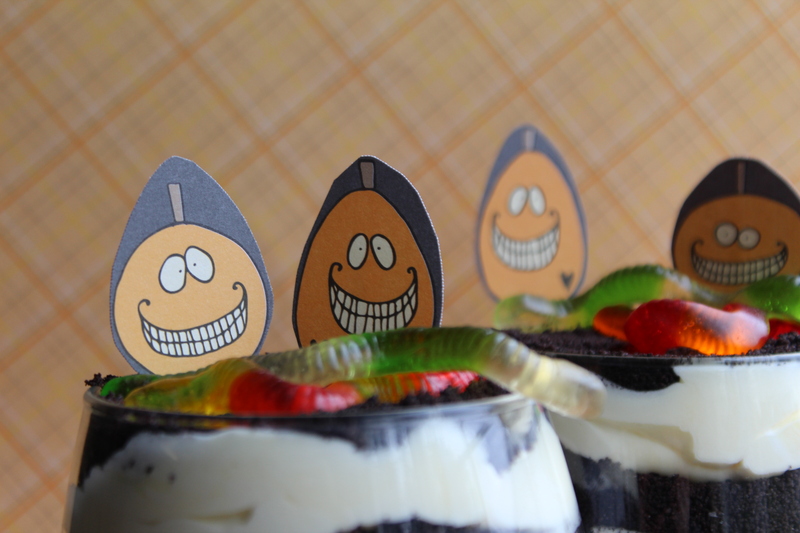 We had some dirt cake for dessert today! Thank you! It is delicious!